Magister SC Miticide from Gowan Company is now registered for use on many specialty crops. Although it is called a miticide because it controls spider mites and rust mites, it also controls some insects (psyllids and whiteflies), and powdery mildew on some crops. The active ingredient is fenazaquin. It is in mode-of-action group as a miticide is 21A, the same group that contains Nexter, Portal, Torac, and Apta. Magister kills mite eggs by contact, and kills mite adults and immatures by contact and ingestion. For fungicidal activity, it is in FRAC group 39. Magister is highly toxic to bees, so care must be taken to not spray it on blooming crops or weeds. Magister has been registered for a few years for use only on hops and cherries. Vegetable crops now on the label are cucurbits (3-day PHI), fruiting vegetables (3-day PHI), and legumes (7-day PHI). Small fruit crops now on the label are blueberries (7-day PHI), caneberries (7-day PHI), strawberries (1-day PHI), and grapes (7-day PHI). Tree fruit crops now on the label are pome fruit (7-day PHI) and stone fruit (3-day PHI). Hops are also on the label (7-day PHI). The label specifies a limit of one application per year on each crop, and a 12-hour re-entry interval. The rates are 24-36 or 32-36 fl oz per acre, depending on crop. A parade of storms will begin later this Thursday into Friday and follow every 3-5 days. 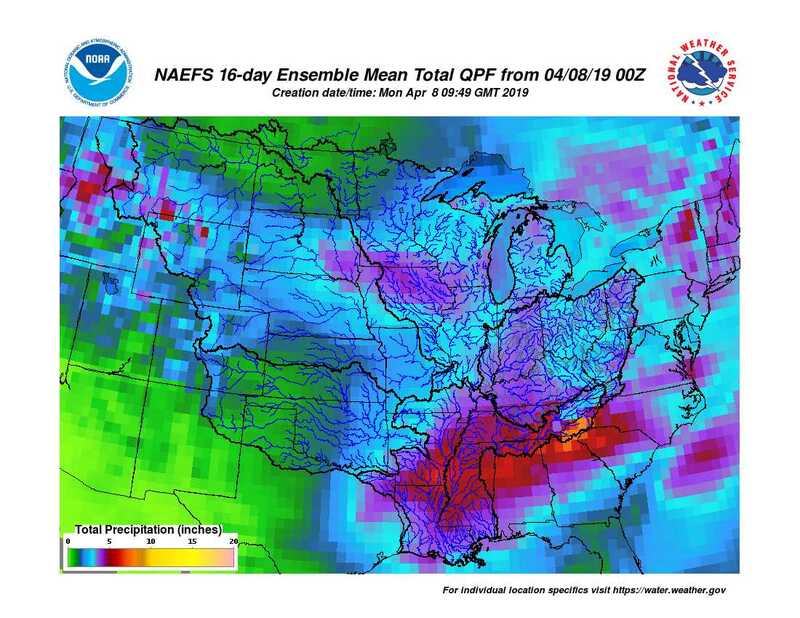 This will cause 2-3 inches of rain on average for Ohio the next two weeks as shown in the attached graphic. Normal rainfall is now almost 1 inch per week. Hence, slightly above normal rainfall is expected. The one exception could be northern and northwest Ohio where it is possible to see less rainfall depending on the exact storm tracks. With all the storms lined up, we do expect a windy April as well. Winds of 30-40 mph with gust to 50 mph can not be ruled out Thursday or Friday this week with storm number one. 30-40 mph winds will also be possible with the storm later Sunday into next Monday and can not be ruled out with the third storm later next week. Other early indications give the possibility of another wet harvest season. Jim Noel is currently the Service Coordination Hydrologist at the NOAA/National Weather Service’s Ohio River Forecast Center (OHRFC). He started in the National Weather Service in 1992 and has been with the OHRFC since 1996 as a hydrologist. Our first sunny days in the 50’s and 60’s are here and many backyard growers, community gardeners and urban farmers are looking to get outside to start spring planting. One important step in this process is to make sure the seed that you are using will have decent germination rates to ensure that you do not start with a crop failure at the beginning. Click HERE for a link to vegetable seed viability times. Have you soil tested your vegetable garden recently? Making sure that you have enough nutrition present to grow your vegetables is another important step in making sure that you have a productive season. Contact your local Extension office to find out about soil testing kits for purchase. The three month precipitation prediction calls for a greater than normal chance for increased precipitation. 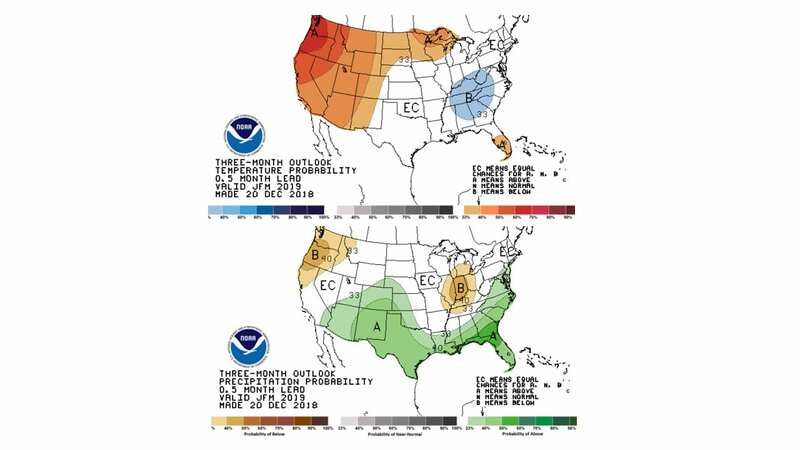 The three month temperature projection calls for a greater chance of warmer than normal conditions. One very important variable to monitor is soil temperatures. Since seeds are in primary contact with soil and need that seed-soil contact to germinate, it is more important to monitor soil temperature than air temperature. Certain seed varieties will need certain temperatures based on what family of vegetable they are in. Most spring vegetables germinate reliably in cooler soil than summer vegetables. Currently soil temperatures as monitored by the Columbus Station (Waterman Farm) of the OARDC Weather System are around 40 degrees F at 5 cm and 10 cm soil depth. (LINK) If you garden in a raised bed, you may have warmer soil than a level garden plot. This may allow earlier planting than normal. Make sure that you do not work the soil via tillage if it is too wet, especially with the heavy clay soils common in central Ohio. This could create a poor growing condition for the entire season if large clumps of compacted soil are created when tilling wet soil. This community garden was mowed last fall with the residue left on top of the soil. A seed bed was created via tillage a few days ago when the soil was at the right moisture level. If you have started transplants under grow lights in a seed station, it may be time to transplant them into individual cells. Check out this video that will show how to divide and transplant seedlings into cell packs. Seed potatoes can be planted later this week if the soil is not too wet to work. If you wish to plant onions but are unsure if you should use seeds vs. sets vs. transplants then click on this article that goes over the benefits of each type of onion planting. It will be time to plant transplants in the garden as soon as we get a few more degrees of soil temperature increase. If you have transplants under the grow lights, it is important that you harden them off for a period to acclimate them to their future outdoor home. 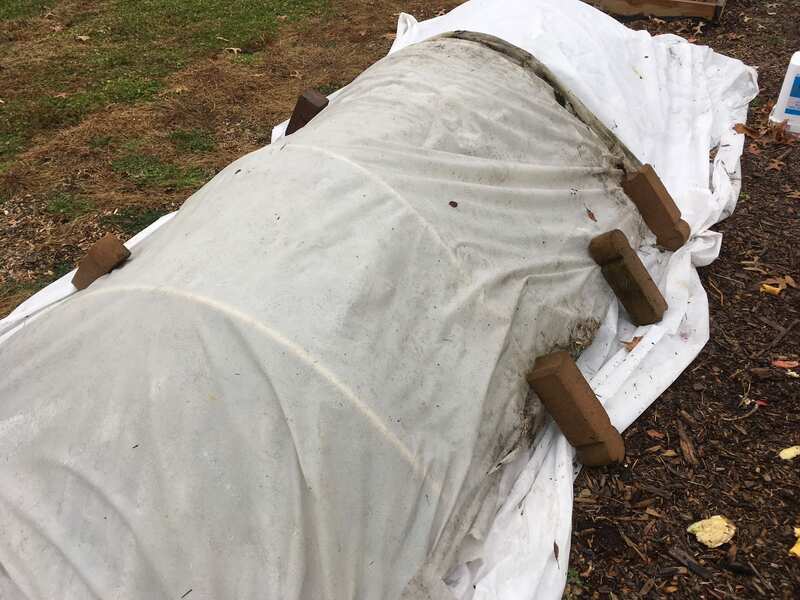 It takes about 3-7 days of gradually introducing transplants to outdoor weather and temperature before they will be adjusted and have success in the ground. Do not forget this step, it is important to do this to minimize transplant shock. The current winter has been similar to last year’s winter, with bouts of warmer than average temperatures and bouts of colder than average temperatures. Anyone who grows sweet corn might wonder whether the winter was considered harsh or mild overall, because after a very cold winter, we can expect to not have problems in sweet corn with Stewart’s bacterial wilt, but after a mild winter, we can expect to have problems in sweet corn with Stewart’s bacterial wilt. The severity of the disease is related to survival of the corn flea beetle, which vectors the causal pathogen, and which is adversely affected by cold temperature. 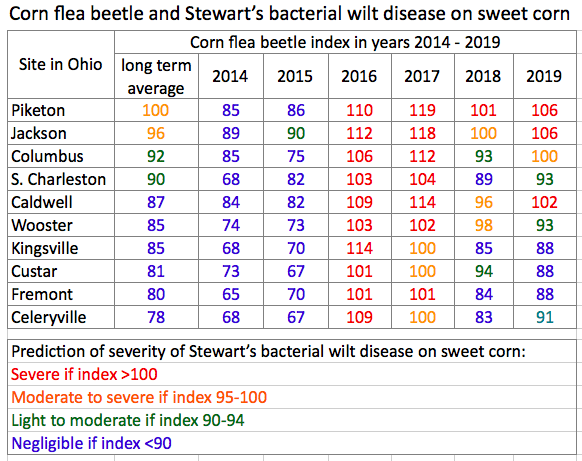 Every year we make a prediction about how severe Stewart’s wilt will be by looking at the winter temperatures and using them to calculate flea beetle index values for several Ohio locations. The index is fairly crude but usually does reflect what we see in the field. The index values for ten Ohio sites in 2019 range from a low of 88 at Kingsville (Ashtabula Co.), Custar (Wood Co.), and Fremont (Sandusky Co.) to a high of 106 at Piketon and Jackson. The current winter was similar to last year, but colder than 2017 and 2016, and warmer than 2015 and 2014. Most of the Ohio sites fall in the low or negligible disease category this year but there are several sites where wilt predictions are moderate to severe. Individual index values are shown in the chart below. These days, most sweet corn hybrid seed is sold with insecticide treatment on the seeds; it can be difficult to find seed that is not treated. These insecticide seed treatments are effective at controlling the corn flea beetle on most hybrids. Systemic insecticide protection is provided on seed that has been commercially by Cruiser, Poncho, or Gaucho. Cruiser contains the active ingredient thiamethoxam (the same AI as in Platinum and Actara) and is made by Syngenta. Poncho contains the active ingredient clothianidin (the same AI as in Belay) and is made by BASF/Bayer. Gaucho contains the active ingredient imidacloprid (the same AI as in Admire) and is made by Bayer. Tests done at the University of Illinois when seed treatments were under development showed that incidence of Stewart’s wilt in susceptible varieties was reduced by about 70% by commercial seed treatment, and severity of symptoms was also reduced. Seed treatments are thus not products that alone will control corn flea beetle and Stewarts wilt. For farms that are not planting insecticide treated seed, the cultural control of disease-resistant varieties should be used. Ratings for over 600 hybrids from Illinois as of 2010 are shown on a website (http://sweetcorn.illinois.edu/HybRxnSum/Hyb-Rxn-Summary-1984-2010.pdf). A few examples of hybrids that are most resistant to Stewart’s wilt are the Ambrosia and Nauset (bicolor se); Sumptuous, Merlin, and Miracle (yellow se); Argent, Celestial, and Denali (white se); Mirai 336BC, Obsession R, and Mirai 350BC (bicolor sh2); and Garrison, Overland, and SummerSweet 7650Y (yellow sh2). 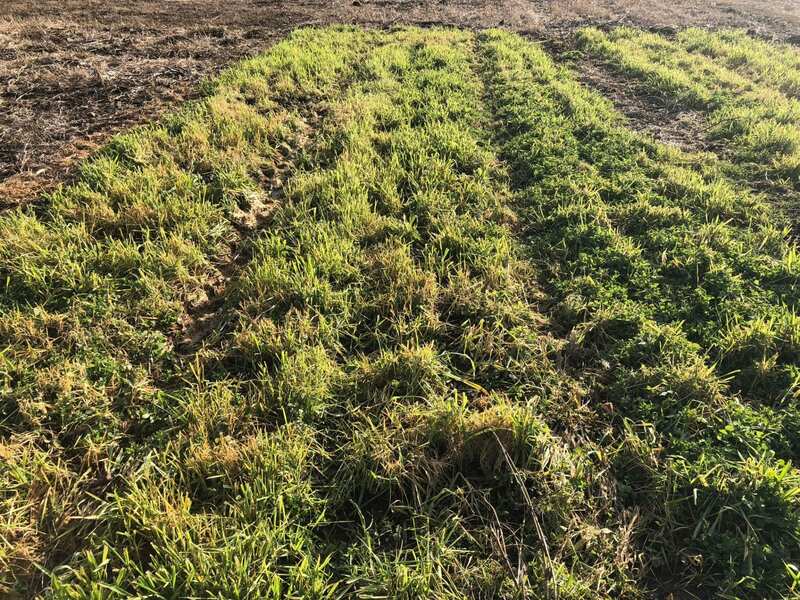 If resistant varieties or commercially treated seed are not planted, it is important to protect seedlings of susceptible varieties from beetle feeding through the 7-leaf stage, especially on farms with a history of problems with this disease. An option is Latitude (imidacloprid plus fungicides), used as a hopper box seed treatment. Another option is systemic soil insecticide, Counter or Thimet, which can be applied to the soil at planting. 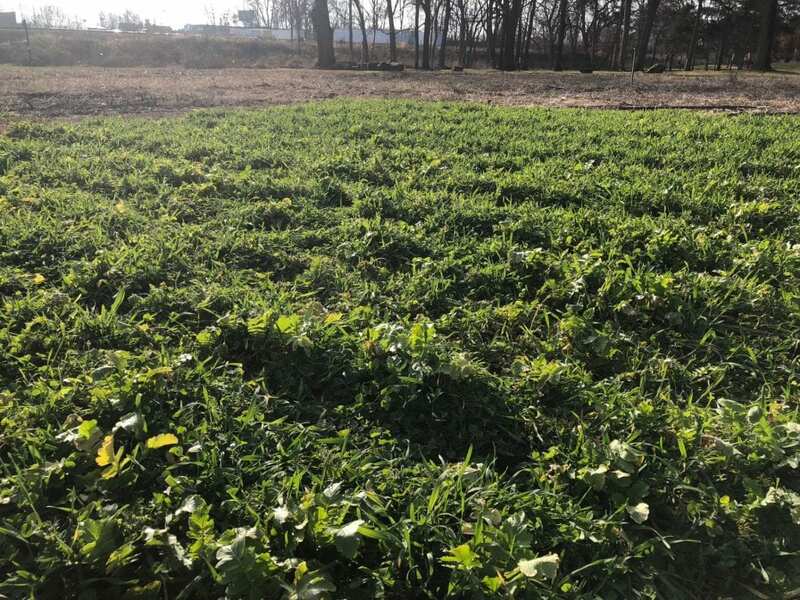 A final option is to wait until seedlings emerge when they can be sprayed with carbaryl (Sevin), permethrin, or other non-systemic insecticide, but the foliar sprays are not usually as effective as the systemic seed or soil treatments. Articles and resources related to organic production are available on the OFFER Organic Food & Farming site, offer.osu.edu. • Information and links to some of our current organic research groups and projects. 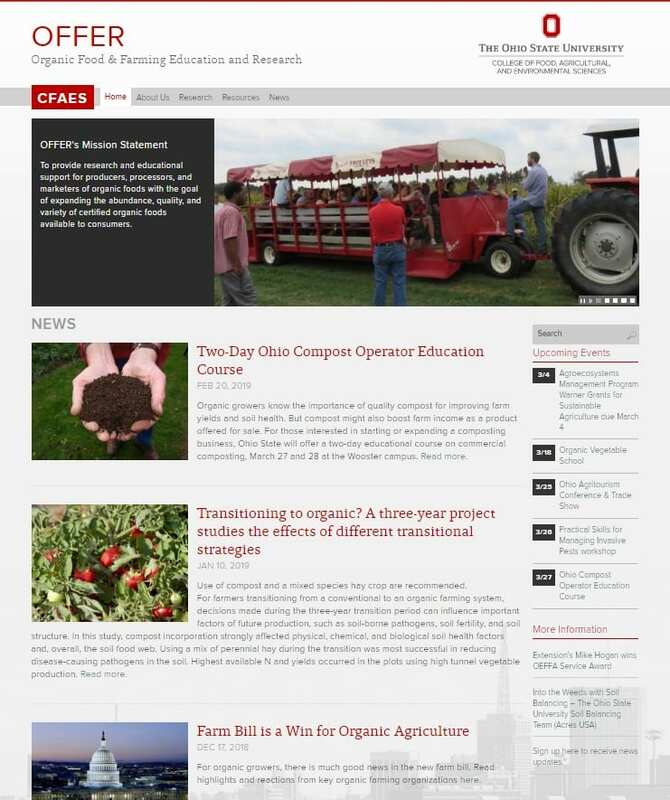 • A list of OSU Extension fact sheets that pertain to organic production. You can sign up to receive new articles and other updates here. As of the most recent agricultural census, Ohio ranked 7th nationwide in the number of organic agricultural operations. Join members of the OSU Department of Entomology and the OSU IPM Program for a workshop that highlights recent research results and reviews the latest recommendations for key practices in monitoring, identifying, and managing the spotted-wing Drosophila and Brown Marmorated Stink Bug on fruit and vegetable crops. Although the spotted lanternfly has not yet been found in Ohio, this invasive pest has been detected in nearby states, so we’ll provide some tips to remain vigilant for this potentially new pest. 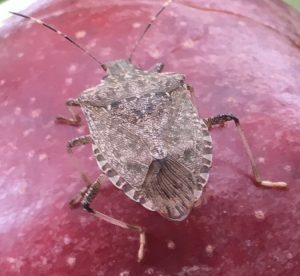 Brown marmorated stink bug on apple. Spotted wing Drosophila male (L) and female (R). Coffee and light snacks will be served. Registration will cost $5 per person and be limited to only 35 attendees due to room constraints. All participants must pre-register using this link (https://www.surveymonkey.com/r/OSUinvasive). Registration will end March 22nd. Payment, cash or check, will be accepted at the door. If you have any difficulties registering or have other questions, please contact Jim Jasinski, jasinski.4@osu.eduor 937-484-1526, or Celeste Welty, welty.1@osu.edu, 614-292-2803.
webinar update on the latest invasive insect to hit the Northeast and Mid-Atlantic regions. 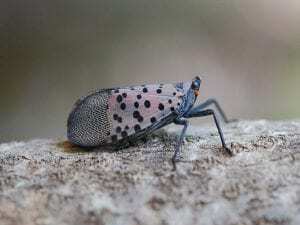 The Spotted Lanternfly (SLF) was discovered in Pennsylvania in 2014 and has recently been detected in surrounding states starting with Delaware and New York in 2017, and Virginia, New Jersey and Maryland in 2018. Two webinars covering hops, berry crops, vegetables, grapes, and apples will be held on February 26th. Two additional webinars on Christmas trees, greenhouse, nursery, and landscape industries will be held on March 4th. To date, SLF has NOT been reported in Ohio. Given the proximity of detections and the possibility of being inadvertently spread by various modes of transportation, we are recommending increased vigilance for this pest. This pest has a wide host range and is known to attack grape vines, apple and cherry trees, and hop bines. This pest also has an affinity for Tree of Heaven (Ailanthus altissima), especially in the fall. Below are two links detailing the full announcement and registration forms for the Produce Safety Alliance Grower Training that will be held at the North Central Ag Research Station, 1165 County Road 43, Fremont, OH 43420, on February 28. There is no cost for Ohio residents to attend this training. Please feel free to distribute to any produces growers who may want to attend. Direct any questions to Matt Fout, (614)728-6250, or Matthew.Fout@Agri.ohio.gov. Lettuce, cabbage-family – this assumes some risk due to weather pressure. Start a small amount now looking to plant outside around late Feb under season extension. Start another small batch every two weeks for the next month or two to have a steady harvest. Leeks – seed takes awhile to germinate. 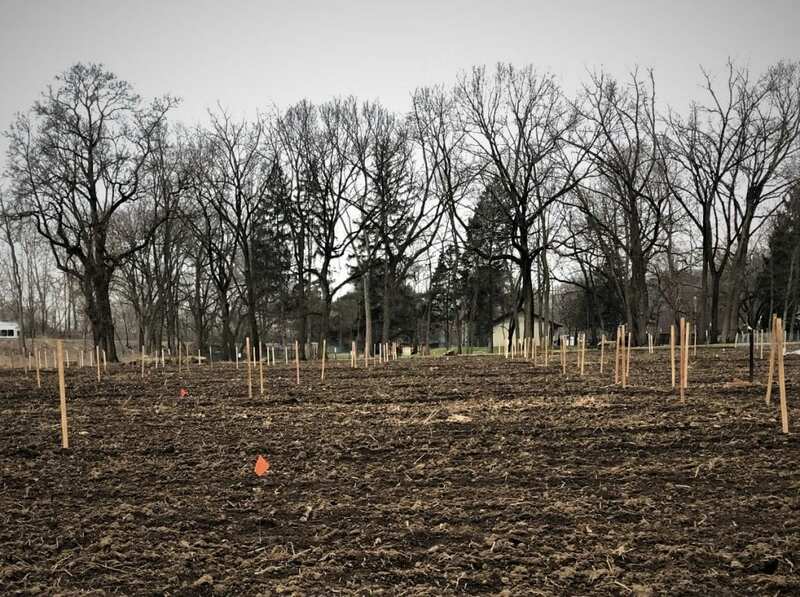 Transplants will be ready to go outside in late March if started now. Winter is a time for many activities, including obtaining new information and reconnecting with friends, peers, and partners. All these activities and more happen at programs coordinated by grower associations, universities, and others. In that light, consider participating in the upcoming Specialty Crop Growers’ Roundtable on February 4, 2019 at the OARDC in Wooster, OH. Every program has something to offer. The Roundtable will offer brief, to-the-point presentations, demonstrations, exhibits, and trainings, and ample time for one-on-one and small group discussion — great value for commercial vegetable, fruit, and herb growers, especially ones active in local to regional markets. There will be plenty to hear, see, say, and do at the Roundtable. Please note: attendance is capped at 50 and pre-registration is required.